When you stay at Armonia Studios & Apartments in Zakynthos, you'll be near the beach and 7 minutes by foot from Psarou Beach. Featured amenities include dry cleaning/laundry services, a 24-hour front desk, and luggage storage. Free self parking is available onsite. When you stay at Medusa Luxury Apartments in Corfu, you'll be 13 minutes by car from Paleokastritsa Beach. The front desk is staffed during limited hours. Free self parking is available onsite. 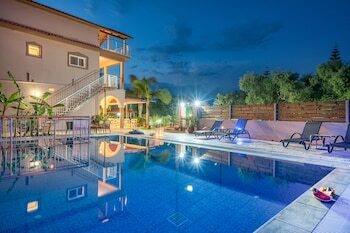 Located in Kefalonia, Ideales Resort is a 5-minute drive from Trapezaki Beach and 7 minutes from Agios Thomas Beach. Free self parking is available onsite. With a stay at Hotel ARGO in Kassandra, you'll be within a 15-minute drive of Siviri Beach and Kalithea Beach. Free self parking is available onsite. Located in Ermionida, this villa is convenient to Port of Spetses and Bouboulina's Museum. Free self parking is available onsite.